Walt Poddubny was 49. He played 11 NHL seasons for the Edmonton Oilers, Toronto Maple Leafs, the New York Rangers, Quebec Nordiques and New Jersey Devils. He had 184 goals and 238 assists in 468 games and topped the 30-goal mark three times. Leaf fans, I need some help with a vague memory I have. 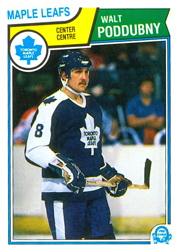 I remember listening to a Leafs game in the early or mid-80s and a huge goal was scored by Walt Poddubny. As I recall the goal, it slowly rolled over the goal line. In fact, I can hear the call of the goal as "rolling... rolling... rolling... the puck is in the net" or something like that. I'm pretty sure that it was Poddubny's goal and if this wasn't a playoff game, it was a crucial late-season game, possibly in overtime. Does anyone remember this Walt Poddubny goal for the Maple Leafs? I now think this Walt Poddubny goal I remember occurred late in game two of the Norris Division semi-final in 1986. The Leafs beat the Chicago Black Hawks 6-4 on this night. Does anyone out there remember the details surrounding Walt Poddubny's goal, our fifth of the night, on April 10, 1986? I am Walt's brother and have that game on VHS. I am going to have to review it and will post later. I am a little bummed out now and looking thru some of his memorabilia. I'm gonna miss the big oaf. Any other memories of Walt would be great to hear. Peter, best thoughts to you and your family, I remember the name (Walt's) from my early and teen years in the 80's watching the Canucks and the Oilers, usually the Canucks got smoked! Deeply saddened and shocked.Our thoughts and prayers are with you and your family at this difficult time Peter. Curtis,Cathy,and Kyle. I remember chatting with Walt before the start of a game you were playing in at North York (then a city in Metropolitan Toronto) Centennial Arena in 1989. He was kind enough to chat and answer any hockey related questions. You were playing for the Thunder Bay team of which Walter was the assistant coach in a weekend youth hockey tournament. I really enjoyed watching him play for the Leafs. He was a hard working forward who took the game seriously and scored a lot of meaningful goals. Peter, I'd like to express my condolences to you and yours and all who knew Walt. I met him at a bar while visiting Toronto in 1982. He noticed I had these buttons on my jacket. One of them was with the 3 Stooges. He began to tell me what a big 3 Stooges fan he was so I gave him the button to keep and in time he invited myself and a friend (we're from Windsor) up to his apt. next to the Gardens to see his 3 Stooges collection. (I'll never forget it for we had just seen Walt play earlier that night against Hartford) He had lots of 3 stooges memorabilia especially videos. He was very nice to us and in fact we met up with him a couple of weeks later when the Leafs played in Detroit and were staying at the Renaissance Centre. His roommate on that trip escapes my memory? Barry Melrose and Mike Palmeteer were a couple of the guys whom I remember seeing back at the hotel. Walt was a very personable guy and I'll never forget meeting him. Wishing you lots of good memories that I hope you too can share with many others. I'm sorry for Walt's passing. Hey peter I'm very sadened to hear what had happened. Our prayers are with you and your family. I'm happy to have had a great friendship with him. Sad to see him go. He will be greatly missed but also greatly remembered. May he find peace. I love yeah Walt. Hey Peter... my thoughts adn prayers are to you and your family. I'm only 31 but remember walt when he was on the rangers, devils and nordiques. I'm in Jersey and a huge devils fan. i remmember my dad telling me (who is a rangers fan) that having Poddubny was huge for the devils because he was a veteran player with good scoreing skills and a team guy. I remember watching him in a devils uniform...i actually think i have one of his cards...anyway... Everyone knows who Howe, Messier, Gretzky...etc are...but only real hockey fans know how much he meant to the game and his family and friends will know how much of an impact he made where it really counts...in your lives. I went to public school with walt when we were kids. My heart goes out to his family. I just heard and it saddens me. Walt was always a sports nut and worked so hard at beating us at everything we played. I will miss Walt, sweat, Poddubny. Many fond memories of Walt! We worked together, roomed together and lived together for a couple years and he will always be a huge part of my life. Best wishes to the family!Bless you all! We appreciated him in New Jersey and honored he ended his NHL days with the Devils. I have some of his cards in my all time Devil collection, forever remembered. Thanks and all my best to you and your family. I have not heard the name in a long time..sad to here it today. I just heard of the sad news this morning. Growing up in the 80's watching the Maples Leafs, Walt was one of my favourite players - very smooth player with great hands. It was shocking when I heard the news on the radio this morning. I wish his family all the best. RIP Walt. I was saddened when I heard the news, I worked with Walt in Las Vegas and Orlando when he was doing roller hockey. He was a good friend, gonna miss him. Peter, my condolences to you and your family. Many fond memories from high school (him standing on the hood of my car to attach mesh to playground basketball hoops - 'don't worry, I'm light on my feet') to sneaking him into the local YMCA while he played for the leafs (of course, the other guys were amazed that a hockey player also had a basketball shooting touch). Always a joy to be with and a great friend who never threatened you in any way - unlike the two little killer dogs you guys had! On behalf of all of our members, past & present we send out our sincerest and deepest condolences to the entire PODDUBNY family and friends. He was a very special hockey player and an even better person, lots of laughs over the years. I cried the night I read that Walt had died. It flashed across the screen during a game I was watching. I met him when I was about 8-years-old and had a huge crush on him (according to my mom). He played with the Wichita Wind. That team actually started my love for hockey. I have a lot of sweet memories of that time in my life. The pictures I have of him will always be treasured. I send the greatest admiration and love from my family to yours. My thoughts are with you and your family. You know I have memories of Walter and the times we spent together from Kindergarten to the end of his Ranger days. Most of them are too personal to share here but my apologies to everyone who got caught in the wake and hopefully we can laugh a bit when we see each other. I was shocked when I heard the news on Hockey Night In Canada (I rarely watch the second game yet alone the intermission, I guess someone wanted me to know). I'm thinking about Walt every hour, a couple of years ago I saw him at the Bluesfest and he said we should get together for a drink but we never did. You always think you'll get another chance. Karl call me when your in town it's been too long and I don't want to miss anymore chances. You too Hany. Thanks for all your great comments friends. They really help in this tough time. Colin, Hany, Karl its great to here from you guys. My family loves to here that you guys are thinking of us at this difficult time. RIP Walt. Too Young Too Soon. I love you man. I worked at Sick Kids in the early 80's. Walt was a friend and came to see one of the very sick children I looked after. He gave him his stick after a Hat Trick. This child never forgot Walt. He came to see him at the Gardens whenever he had a chance. He was so proud to be met by this selfless man. He will always remember Walt. So will I.
Stewy, We'll be in touch. Here's my e-mail karlsugar@hotmail.com. I'll be up there the 1st week of July. Pete my intent was to fly up for the funeral but no flights are open. I've got some old photos of Walt I would like his kids to have. Maybe I can send you them. Thanks guys and peace to everyone. That would be great Karl. Email me at poduski75@gmail.com. As a fan of the Anchorage (now Alaska) Aces from the mid ' 90's on, I send my condolences to Walt's family. He was, without a doubt, a most inspiring and personable leader for the Aces and the city of Anchorage. We were lucky to have him share those years and create memories with us here. God Bless. I have been looking through some of Walts old video highlight tapes but cannot find any of his Toronto video highlites. If anyone out there has any or knows who I can contact for some please let me know. I had a very good working relationship with Walt that spanded over the 6 seasons that he coached and managed the Alaska Aces of the WCHL. I sent a number of my clients to Alaska over the years and Walt was always grateful and accommodating. I will not forget the opportunity that he provided these young men to play professional hockey. We had many telephone conversations over the years and for that "Thank You". I'm very sorry for your loss. I understand LeafsTV sometimes airs that game 2 of the Leafs-Blackhawks series in 1986. If I learn it's airing, I'll figure out how to get Walt's goal onto YouTube so we can share it here. Terribly sorry to hear of the news. I remember the days we played at Carrick and Walt was there to dazzle us with his skill...and give me the odd face wash as well :-)!! We didn't get that pleasure at Carrick too often...but it has left lasting memories that I share with all of my hockey loving friends I know today....."we got to play pick up with a pro"!! Joe & I send our condolences and wish the best for your family in this difficult time. I'm watching Classic NHL Hockey on Leafs TV and Poddubny scored a great goal in game 5 of the quarter finals against St. Louis in 1986. I picked up the laptop to see what Poddubny is up to and find out he passed away. Terrible. I worked at MLG in concessions in the mid-80's - the best job a kid could have - and got to watch Walt play. I loved his wrist shot. I was a good friend of Walt's for a couple of years while he was here in Toronto. I even looked after his apt. next to the Gardens one summer while he was back home. He was a great guy and a great friend. We shared some great times hanging out down in the bar district in Toronto, playing table-top rod hockey (he had just as good a wrist-shot in that as on the ice! ), and watching 3 Stooges. I was stunned and saddened to hear of his passing. My condolences to the familly. Hey Peter, I remember Algonquin Ave. where my grandparets used to live. They always talked about Nadia coming over and visiting...your mom treated them well. In the later years we used to drive by your place and say Walt lives there (wonder how his hockey is going) My Nanna passed away two weeks ago...guess she is visiting Walt now taking care of him as your mom did for them. My Grandpa is almost 100 (this summer) still creating sh_t at the Heritage...God be with you and your family. Many great memories of walt ,met him in toronto right after he got traded from Edmonton. We became really good friends and hung out until he was traded to the Rangers.He was a Class guy with a big heart who everyone liked. I will never forget Walt and the great times we had.I was shocked to here the news.My deepest sympathy to you and your family. God where do I start. The guy could flat out hit a softball. The West End Spiders. The great weekends we all spent in Duluth playing softball. Mackett, Owchar, Koski, My brother. We had so much fun that time seemed to stand still. Sorry Pete but you were always the little kid that used to like to hang around. I remember when Walter was traded to the Leafs. It was crazy. One of your best friends playing for your favourite team. I recall sitting in Dave Macketts car in the Safeway parking lot trying to pick up the Leafs game on he radio. Dave had a special radio that could pick up China. Even though craclky I remember hearing "assisted by #12 Walt Poddubny". I think we had six guys in the car, snowing outside, windows fogged up and us going nuts cheering. We had a ton of fun growing up at the Westend. Spiders have lost two great guys. Walt and Barry Niemi. The #4 and #5 hitters. God has given us our memories, that we might have roses in December. Hi, this is Andy, writing from Germany. I saw Walt Poddubny when he was playing for "EC Bsd Nauheim" in Germany .. It was such a big thing for us in this small city to see a former NHL player playing in our old, little hockey arena. I can also remember Walt beating up a player of the opponent team. And of course I remember a lot of beautiful goals, scored by Walt. I was a season ticket holder back when Walt played for the Rangers,met him after a game one night,still one of my all-time favorites,very personable guy,chatted with us for awhile.i live in TX now and guarantee you im the only guy in TX,with an autographed pic of Walt hanging in my bar.Sorry for your lose Pete,Ranger fans will miss him. Met Walt in Indy when he played with Witchita. Many fond memories. He was such a sweet guy & I think of him often. Only 43 comments? C'mon, we can do better... Leave a comment above and let's keep this conversation going!